I’m chuffed to have been interviewed for European Supermarket Magazine’s latest Pan-European Beauty Report, discussing the importance of social media in the marketing of beauty brands. European Supermarket Magazine (ESM) is a trade magazine for senior management and retail buyers that, along with a two-part Beauty Report in its most recent issues, is introducing regular beauty content as part of its core editorial offering. 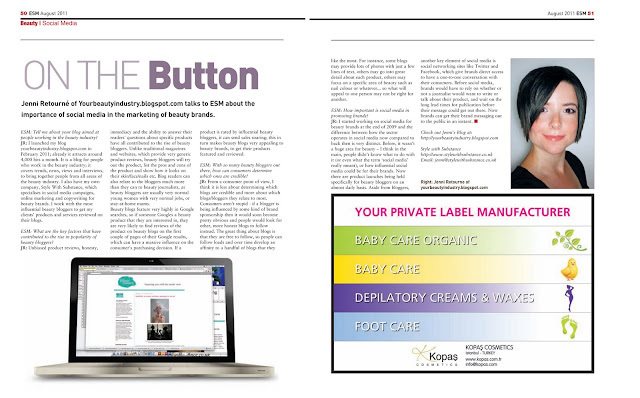 My interview includes my thoughts on the development of social media within the beauty industry, the importance of beauty bloggers within a company’s marketing plan and how social networking sites can benefit beauty brands. You can read the interview by clicking and zooming in on the image above, or click here to see the full magazine and the Pan-European Beauty Report Part 2 online. The beauty report starts on page 44 and my interview is on pages 50-51. Visit ESM’s website at www.esmmagazine.com. Hi Jenni! Thanks for sharing your insight into how beauty brands can work with beauty bloggers to market their products effectively. I especially appreciate your point about credibility - being authentic is so important when it comes to both corporate and personal brands, and both parties need to be honest with their opinions and motivations in order to make the partnership work. Thanks Zoe, glad you enjoyed it!